Find artworks, auction results, sale prices and pictures of Inez Buchanan at auctions worldwide. Inez Buchanan (exb. 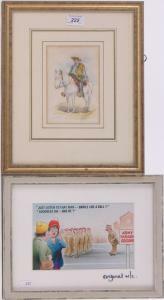 1903-1919), watercolour, Gaucho on horseback, 6.5" x 4" and Arnold Taylor, original postcard illustration design, framed, (2).